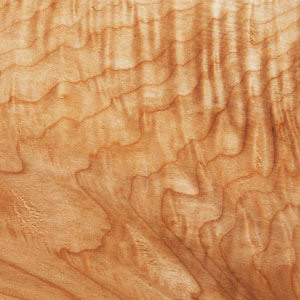 Our Curly Maple is also a favorite for its texture and grain. Each piece is unique. The figured blanks and slabs have a grain similar to Quilted Maple, but the wood fibers create larger and more deeply undulating waves, perpendicular to the grain. Some of our Curly Maple, like Quilted Maple, is instrument grade and this variety is frequently used for guitars and mandolins, and even guitar picks. Usually our Curly is flat-sawn rather than quarter-sawn. Our Curly Maple pieces come in a variety of woodtones — from pinkblond to dark brown to warm reds. MC 6D111318: 6" x 6" x 3"
MC 7A111318: 7" x 7" x 2"
MC 5E111318: 5" x 5" x 3"
MC 5A120418: 5" x 5" x 3"
MC 5F111318: 5" x 5" x 2.875"
MC 5A031219: 5" x 5" x 3"
MC 5A112018: 5" x 5" x 3"
MC 6A112718: 6" x 6" x 2"
MC 6C111318: 6" x 6" x 3"
MC 6B112018: 6" x 6" x 3"
MC 6E111318: 6" x 6" x 2.875"
MC 6B120418: 6" x 6" x 2.75"
MC 6A112018: 6" x 6" x 2.75"
MC 6A031219: 6" x 6" x 3"
MC 6B031219: 6" x 6" x 3"
MC 6F120418: 6" x 6" x 4"
MC 7B031219: 7" x 7" x 3"
MC 8B031219: 8" x 8" x 3"